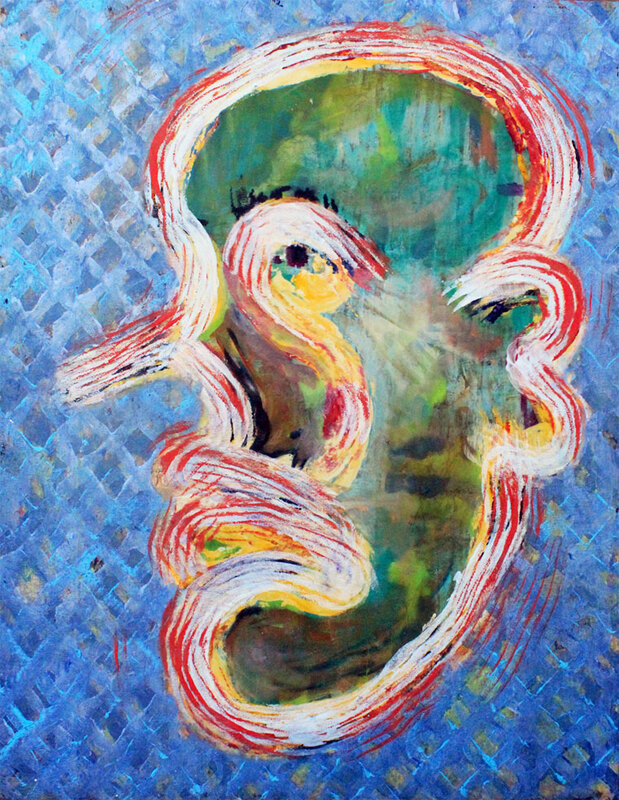 Painting the Patriarchal Brain – Napo B "Live"
When I was fifteen my father gave me four or five magazines he had kept from the end of the second world war. Though not official magazines, but fan publications that dealt with the Trials at Nuremberg, the rise and fall of Fascism, and one that dealt with Benito Mussolini and the Italian Fascists movement. In it where all sorts of images including the demise of Mussolini, with graphic pics of him being beaten, and killed by an enraged mob and dragged through Rome to be finally hung. The one image that stood out was his large bald head swollen beyond recognition, his bulbous head covered in cuts and bruised beyond recognition. Now we jump forward to from the fifties to 1987 and being on a night train from Catania Sicily to Rome. The train was very old, so it had a perceptible war vibe to it, at one point the train was left on a siding for about an hour, probably waiting the main rail line it was used by other trains. The scattered pot lights threw the train yard slowly moving in the four am light, old rail cars painted army green or brown. For a moment it brought me back to that image of Mussolini’s head, and it evoked that same sick feeling of our patriarchal world that I had as a male child. In the following days in Rome we visited the many vestiges of the Vatican’s plunder in the collection of the Musei Vaticani, the still existing Fascist brutalist modern architecture, just to mention the Colosseum, the catacombs of St Sebastian or the bone heaps of the Church of the Immaculate Conception. I realized that a new painting of the patriarchy had to be painted, a brutal allegorical painting. In this work we see the caboshed head of Mussolini in a rage as his cheek is being sucked of blood by an enormous mosquito. He is screaming into a telephone with a broken line, and another by his ear, his brain is represented with a broken oak tree, which has real acorns embedded into the panel. The city outline at the top of the painting is taken from a fascist medal which was given to me by a friend in Rome with the instruction to destroy them; which I did by going to Naples and throwing them into Vesuvius. The Duce is looking at a postcard of Rome, at the bottom two wolf paws are open with two stigmata points which are holding a copper tube presenting fresh daylilies. At the bottom you can see an erupting Vesuvius with the medal above. The patriarchal brain chomps down on a vivisected flower in it’s rage in it’s inability to connect or affect control over it’s environment. 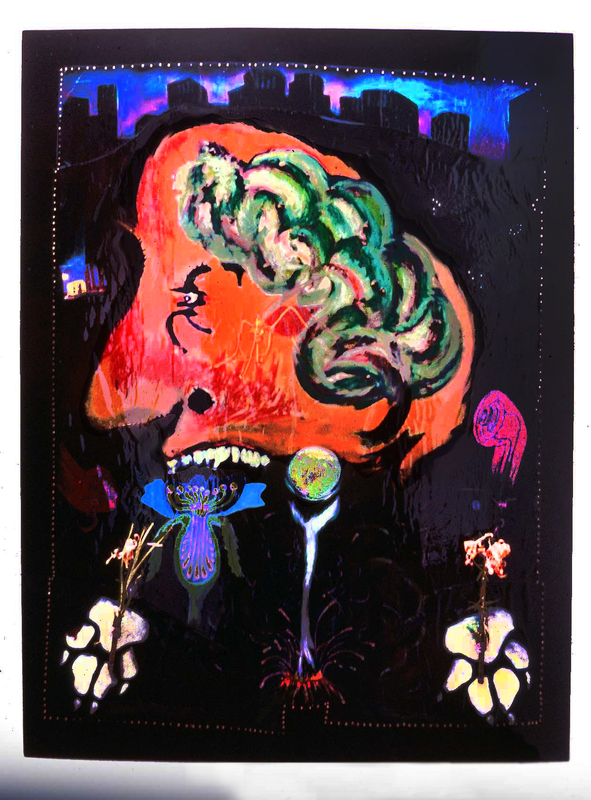 The Patriarchal Brain was painted in 1987 for a group show in Winnipeg, Manitoba at the WAG curated by Shirley Madill, and later shown at the AGO. I have included this second painting “Patriarchal Ambivalence”, which shows a subdued ambivalent male head cut off from any outside reference point.